Led by the Year 6 class, the school stood for the national anthem, while parents and special guests from the Kalamunda RSL and Warrant Officer Class 2 Nigel Bennett watched on. 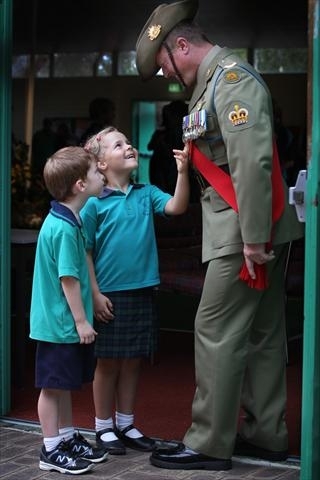 WO2 Bennett served in the Australian forces for 27 years and still serves in the Army Reserves. He is also a teacher at the school. He shared his values with the students and reminded them of times less fortunate. He encouraged them to remember that when times seem tough, or if they’re asked to do something they don’t want to do, to remember the Anzacs and how they endured even tougher conditions. ‘They were without heating, food or even water, so remember how fortunate you are. Always do your best, whether at home, in school or the community,’ he said. Each year the Year 6 students host the event and talk about their family members who have served in wartime. Sophie Thin (11) told how her uncle, Kim Smith, did active service with the RAF during the Gulf War. ‘He received four medals in that time. He received medals for fighting in Saudi Arabia, Kuwait and received a medal for going to the Gulf War and one for long service,’ she said. Sophie said Anzac Day was important because we should not forget those people who made sacrifices for us and defended our land for our freedom. Principal David Ingle said the ceremony was very moving. ‘This year was extra special because Mr Bennett’s son Cody (11) was in Year 6, and he spoke about his dad,’ he said. Representatives from each class laid wreaths at the flagpole as a mark of respect to honour the servicemen and women who lost their lives in service. Mr Ingle said the students were very well behaved and treated it so solemnly. ‘The students all sing I am Australian at the end; it is really wonderful,’ he said. Former Falls Road Primary School student Alexander Grant (14) performed The Last Post, and after one minute’s silence he performed Reveille as the flag was raised to full mast.